He is simple and sweet. He's an Aquarius, of course. He loves a long swim - flippers and goggles and all. You can find him down by the pool most any day of the week. He could give Michael Phelps a run, er swim for his money. 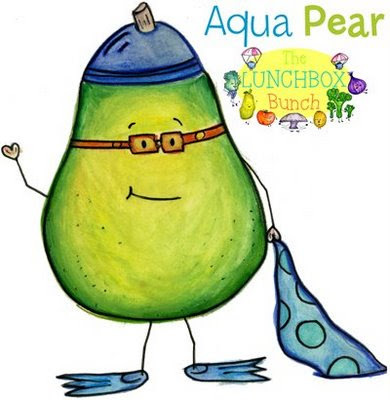 If you love to swim and are a aqua girl or guy at heart, you'll love Aqua Pear. And don't forget the super food nutrition facts of pears! Michael Phelps is an eceptionaly talented athelete. Phelps smoking a glass pipe should say something negative about the drug laws and not about the man. If you can achieve what Phelps did in the Olympics while high then we should reconsider why we choose to make getting high illegal. Phelps personifies a strong work ethic and a desire to win. Michael earned his wealth unlike the wall street barons and phony politicians. It is our choice to accept the drug war or to rally against it. The war on drugs is a war on the American people, I think this incident is a good example of that idea.